/ Why are Havanese So Hard to Potty Train? Why are Havanese So Hard to Potty Train? As mentioned a lot in other blog posts I wrote previously, Havanese are intelligent dogs. In terms of the ability to be trained, you can go as far as training them to become good watchdogs. So, as an owner or a potential future owner of a Havanese, it is really up to you to choose what kinds of training that you want to provide to your Havanese. You can teach your Havanese all the cool tricks in the world or you can just simply let your Havanese play around with no formal training. But one type of training that you cannot get away from is to potty train your Havanese. In this blog post, I am going to discuss with you whether it is difficult to potty train Havanese and if so, why is it so hard and what you should do about it. Is It Difficult to Train Your Havanese? The short answer to whether Havanese are hard to potty train is “yes”. Let me be more clear here. What I mean by “hard to potty train” is that it is harder to train Havanese relatively to other breeds of dogs. Generally speaking, small toys that are categorized as toy dogs are more difficult to potty train. Although I won’t exactly categorize Havanese as toy dogs but they are certainly small dogs that are close to being toy dogs. Are there reasons why small dogs are hard to potty train? Is it because of their genes or it is due to some human factors. Let me try to explore with you on this subject now. Do Small Dogs Have Genes that Make Them Hard to Potty Train? Whether it is because of their DNA that make small dogs generally harder to potty train is a very difficult question to answer and to prove. After spending quite some time on this particular subject, I still have difficult finding any proven answer or theory. For myself, I tend to believe that there is nothing that is DNA-related that causes small dogs to underachieve in this aspect. My argument is that the Havanese is a very intelligent breed that excels in a lot of different type of trainings. I don’t see how Havanese can learn something very difficult and tends to take more effort to learn how to poop properly. There must be some human factors that we have overlooked. So, we are now left with some hints to further examine the question whey Havanese and other small dogs are difficult to potty train. Hint number one, it is likely not genes that cause small dogs the difficulty. Hint number two, it is likely human factors if it is not about the genes. Hint number three, small dogs are the general group of dogs that is difficult to potty train. After combining these three hints, there are some theories that people have come up with. 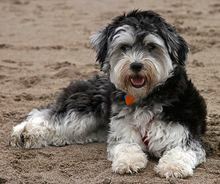 Since small dogs are so light and easy to carry, and they are so cute that we can’t help but carry them like babies, there are a lot of Havanese owners who has the tendency to carry them to their “washroom” instead of making them walk themselves. If you consistently do that, it help your Havanese develop the bad habit of not having walking or not to spend any energy before pooping. As it is impossible for you to be around your Havanese all the time, your Havanese simply develops poop where he sleeps or plays when you don’t carry him. For many people, having small dogs seem to be very natural and logical for them because they live in a small apartment. The only type of dogs that they can own are small dogs like Havanese. In this case, it is very natural that the area you design for your dog to eat, to sleep and to poop are places that are close to each other, may be within a meter of each other. In this case, it is very confusing for them if you want them to learn that there are actually three separate places for three different types of activity. According to the above mentioned two human factors that cause Havanese and other small dogs to become difficult to potty train, here are some logic and easy actions that you can take. First action is very simple. You simply don’t carry your Havanese to their pooping location and you let him walk there. The second action takes you some effort to think about how to use your home’s space efficiently and creatively. You have to pick three locations at your home that are meters apart from each other. One location for sleeping, one for eating and one for pooping. Doing these two things doesn’t mean that you are done potty training your Havanese. It only means that you are not making it harding than it is supposed to. Potty training your Havanese is all about habit developing. In other words, make him do what he does over and over again. If you are already good at training your Havanese puppy to do different things, you may already know that there are two secrets about the power of habit. The two secrets are “the trigger” and “the reward”. To make this simple, you can use a simple trigger like a vocal command or a whistle or any type of hand sign as the trigger to request your dog to perform an action. But since you don’t know when exactly your Havanese needs to poop, the trigger is not useful in this case. So, you are left with “reward”. Simply make your dog walk to the pooping area and wait for him to eventually poop. Give him a biscuit after that and do that process consistently over time. Eventually, your Havanese will develop the habit of knowing which is the location for pooping. In conclusion, Havanese and other small dogs are hard to potty train because of mistakes we human make. With some patience and the use of rewards, we can definitely properly potty train our Havanese.